NFL Commissioner Roger Goodell claimed that quarterback Ben Roethlisberger didn\’t have support of teammates following a tumultuous offseason and several players are calling BS on that. As several teammates rebuff Goodell\’s claims no one defended Ben. 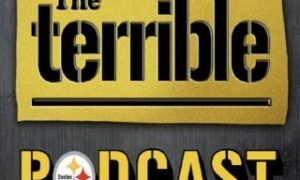 Episode 32 of The Terrible Podcast is up and we get you up to speed on the Steelers first day in Dallas. Also David Todd has a great open letter to Ann Killion of Sports Illustrated in defense of Ben Roethlisberger. The Steelers offensive line decided to honor Flozell Adams for his first trip to the Super Bowl, with all of them wearing Adams’ Michigan State college jersey on the flight there. Here is a video recap. Adams talked about it in his presser today. Steelers rookie wide receiver Emmanuel Sanders, a former star at SMU, is writing an online exclusive Super Bowl XLV diary for the Star-Telegram this week. Here’s his first installment. According to Brett Keisel, his beard is magical, powerful and one of the greatest of all time. We have to agree and hope it has one more in it on Sunday. John Harris gets an early look at the Steelers free agents with unsettled futures.